By Laura - Costa Rica - 08 Feb/03 - Viewed 1697 times. We flew from Quito to San Jose on the 4th of February. This was roughly one month later than we had originally planned. Unfortunately it means that we will be rushing through Costa Rica, Nicaragua and Honduras. This will allow us to spend a decent amount of time in Guatemala and Mexico. The plane was less than half full. Perhaps if they reduced their prices then more people would fly with them. We were interrogated twice before we checked in. They seemed to be concerned that we might be taking illegal souvenirs with us. Then just before everyone was about to board security decided that they needed to search Mark's backpack. The offending item turned out to be a travel game of Othello, which they thought might be explosive. Costa Rica is one hour behind Ecuador so we arrived at just after 4 in the afternoon local time. The airport is 16km from the centre of San Jose and a taxi costs about 5348c. However, if you wander just outside of the terminal then you can catch a bus for less than 382c each (try to get some Colons for the bus). The bus stopped at a one of the many terminals in the city and we walked to the Gran Imperial Hotel. It is one of the most basic places that we have stayed in but we weren't planning to stay long and it was one of the cheapest at 3056c for a double room. It was also quite close to the bus terminal we were leaving from the following morning. We were only in San Jose for about 11 hours and I didn't really like it very much. We left for Monteverde on the 6:30am bus from the Atlantic Norte Terminal, which cost 2950c for both of us. The bus took just over 5 hours and actually drops people off in Santa Elena. During the last two hours the roads were so bad that we only covered 32km. We walked round the corner and got a room at Pension Santa Elena. It costs 1910c per person and has a well equipped kitchen. We wanted to see a few things in the afternoon so we had a quick lunch at one of the sodas (like a cafe). I had casado for the second time. This is a traditional Costa Rican dish made up of rice, black beans, vegetables and either meat, fish or egg. We managed to get on the 1pm bus to the Monteverde Reserve. We didn't actually visit the reserve but went to the hummingbird gallery near the entrance. The gallery is one of the few things in Monteverde that you can see for free. It is basically a garden with lots of feeders to attract the hummingbirds. They buzz about all over the place and move very quickly. Sometimes I could feel them brush my ear or T-shirt as they flew by. A kinkajou (a mammal that looks a bit like a small monkey) also came to one of the feeders, hanging upside down from a branch to be able to reach it. We left the garden after about an hour and started walking back towards Santa Elena. After 45 minutes of walking we arrived at the Orchid Garden. We chose to have a look without a guide (1910c each without guide, 3056c with). The garden claims to have the smallest orchid in the world with flowers only 1mm in size. We were given some magnifying glasses so we could see them. It is amazing how many different orchids there are in so many different shapes. They have over 400 species and some of them have very unusual flowers. There was one with flowers that looked like bow ties. Another 10 minute walk down the road brought us to the frog pond. It cost 6100c for both of us, including a tour. We were able to see several different species of frogs and toads, including blue-jeans dart frogs that look like they are in superman costumes. Sometimes it took a while to spot them hiding in the plants but eventually we were able to spot them all. There is a tank full of tadpoles and some are in the final stages of their metamorphosis, so they look like fully developed frogs but still have their tail. It was a really interesting tour and you would not see nearly as much without a guide. We were told we could return in the evening to try and spot them with a torch and to hear them at night. Once we had had some dinner we returned and we able to spot most of the species again. 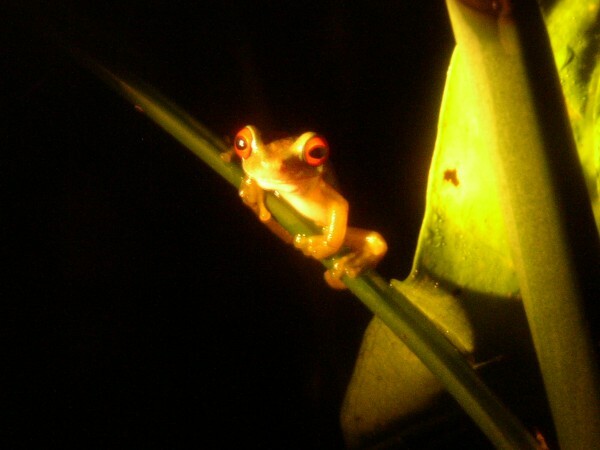 The frogs are a lot noisier at night and some of them make very strange noises. On our second day in Monteverde we did one of the canopy tours. We arranged it through the Camino Verde travel agent in Santa Elena. There are 4 or 5 different canopy tours now and they vary quite a lot in price. We chose the Aventura one, which cost 13370c each including transport there and back. When we arrived we got kitted out in a harness and a helmet and were shown the proper way to position yourself on the rope and then we were off. The Aventura tour has 16 zip wires and a tarzan swing. It is really good fun flying from one tree to the next but not something to do if you want to see wildlife. They save the longest and highest wire until last and I was glad when one of the instructors went with me as I didn't want to get stuck half way on that one. In the afternoon we walked out to the butterfly gardens (about a 40 minute walk). It cost 6000c for the 2 of us, including a guided tour. Most of the guides and volunteers who get a room and food in return for taking the tours. Our guide was incredibly enthusiastic about the insects and the butterflies. First we saw the insects and arachnoids. We learned that each species of tarantula has its own tarantula hawk, a bit like a big wasp. They kill the tarantula by laying eggs on it and then the young eat the tarantula from the inside out. Apparently one of the hawks is as big as a sparrow. We also saw scorpions, bugs and insects that disguise themselves as leaves and branches (whose names I have forgotten). After that we were taken to the butterfly garden. There are 3 different huts designed to simulate different levels of elevations and hence holding different types of butterflies. It is better to go earlier in the day if you want to see the butterflies when they are most active but we were still able to see a few different kinds. There is one called a postman butterfly because it goes to same flowers in the same order. The final exhibit was a colony of leaf cutter ants. We were able to look at each different type of ant through a magnifying glass. It is amazing how organised ants are. The next day we started early with a tour of the Santa Elena Reserve. There are two cloud forests in the area - the other one is the Monteverde Reserve. When I asked our guide David if there were any big differences between the two he replied 'this is a cloud forest, Monteverde is a crowd forest', although he did concede that Monteverde had quetzals at this time of year when they wouldn't get them for another fortnight. He said we should concentrate on the plants because we were unlikely to see any wildlife as the forest is so large. Apparently there are over 2000 different species of fern in the forest. There were a few strangler figs along the trail. These begin life as an air plant on another tree. It sends down a root to the ground and graudally gets bigger and bigger. After about 80 years it will have killed the original tree and the fig will be hollow. It has the amazing ability to weld itself together and is impossible to cut down with a chain saw. Every so often we would hear a bird and David would know exactly which bird it was. One bird is called the ventriliquist of the forest because it emits 2 calls in different directions, on after this other. This makes predators look either side of where the bird actually is. Despite not getting our hopes up we spotted a spider monkey up in the trees. After a while a few more came along and we stood and watched them until they were out of view. We also saw a few different birds. Once the tour was finished we waited for the 11 o'clock bus to Santa Elena. We made our lunch and had a rest before walking out to the Ecological Farm. We spent an hour and a half walking one of the trails there. We saw an agouti, a squirrel and lots of coati mundis. Occasionally we would hear a load rustling coming from the bushes and we expected to see a large animal but it was always a bird. We had felt quite lucky to get a glimpse of a coati mundi but once we got back to the information centre there were loads of them around. Unfortunately we couldn't say the same about sloths. We walked from the Ecological Farm to the Hidden Valley Nature Trail to do a night walk. There was another English couple on the tour with us. When we started it wasn't quite dark and our guide spotted an agouti that would be settling in for the night soon. He pointed out several tarantulas hiding in tree stumps. We must have been walking past them all day. He tried to get a couple out of their hiding places using braches but didn't succeed. We didn't mind as we didn't want to see an angry tarantula. We spent a bit of time looking for a sloth as one of the guides had spotted one just before it got dark and the don't move very quickly. Unfortunately it remained out of sight. It was weird walking around the forest at night and without the guide I would not have had a clue which way to go. It was amazing that he managed to spot some of the things he showed us. We saw a couple of birds sleeping on branches. We were able to stand directly below one of them and see that it was only standing on one leg while it slept to preserve warmth. The tour took about two hours and after all the walking we had done in the last few days I was looking forward to relaxing on the beach.